Quarries can be dangerous places to visit because of potentially loose rock on the faces and great care must be taken. Apart from appropriate boots for walking over loose ground, hard hats should be worn if prolonged study at the bottom of a rock face is planned. No climbing should be done. They can also be very overgrown which makes access difficult, and makes obstructions, uneven ground or pits difficult to see. Permission to examine must always be obtained from the owners where they are obviously private. Ouaisné quarries, SW Igneous Complex. weathering features, SW Ign. Complex. 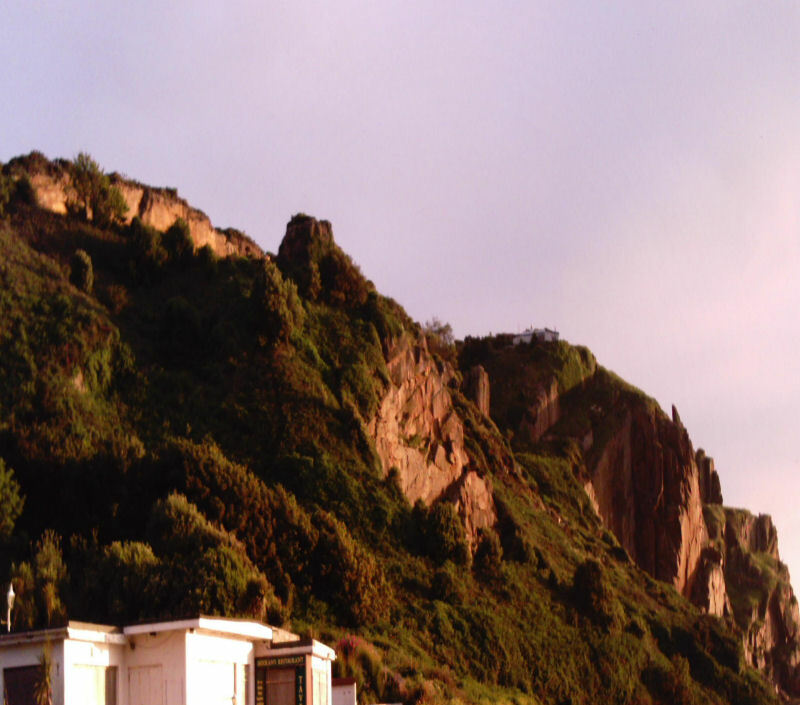 Nevertheless, there are interesting detective trails across and around the island, either by examining the rock outcrops and trying to determine which type was used in a roadside wall, farmhouse, church, castle or sea wall, or by investigating the quarries and checking the stone and masonry in the nearby built landscape. Although many of these structures were built from rock nearby as it was cheaper, many also contain stone from other parts of the island, and even from areas overseas such as Les Écréhous, Les Îles de Chausey, Normandy and southern England. Roofing slate however, came from Wales, Normandy and Brittany. Every rock type has been quarried in Jersey but all the quarries are now abandoned except for three which are still working; Ronez, Gigoulande (Granite Products) and La Saline all in the Northwest Igneous Complex. Formerly, the stone from the quarries around the island was used for building our Manor houses and their wind and water mills, for our churches and chapels, for the farms and private houses and their boundary walls, for the castles and forts, for harbour quays, jetties and warehouses, for sea walls, promenades, steps and slipways, and for paving and cobbling roads and building dams. Some stone was more attractive and therefore used more widely across the island, while other stone was used more locally (Cox, 1966. pp. 94 - 97). Nowadays, of the three working quarries, La Saline provides building and ornamental stone, while the larger ones concentrate on providing aggregate, road metal, concrete blocks, and a clay-granite chip mix called hoggin. Nowadays too, many different types of stone are imported for internal domestic use and for ornamental work such as the facing stone on many buildings in St. Helier. In contrast, it is good to see that much stone is recycled at the quarry adjacent to La Saline, and that many masons work at dressing the stone and using it in building, often using granite as new facing stone, but also using it to repair and restore older properties. 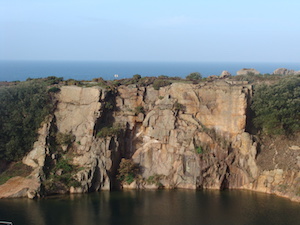 With such striking varieties of pink granite, many of the quarries are in the three main outcrops in the Northwest, Southwest and Southeast Igneous Complexes, but others occur in the shales (Jersey Shale Formation), in the andesites and rhyolites (Jersey Volcanic Group) and even in the conglomerates (Rozel Conglomerate Formation). Quarries are marked on several maps and interesting abandoned ones occur in the granites of each igneous complex. In the SW Igneous Complex, quarries occur mainly in the coarse outer granite from La Rosière north to the roadside quarries near La Pulente (La Carrière) but they also occur in the porphyritic granite and aplogranite exposures at Ouaisné and southwards, and in the aplogranite along the coastal path south and east of the prison. 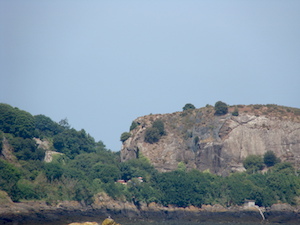 In the NW Igneous Complex, quarries occur in the coarse outer granite from L'Étacq northwards to La Grève de Lecq and include ones on Les Landes and just east of Grosnez Castle. On Le Rouge Nez headland further east there is a quarry in the aplitic, biotite granite but access is restricted as there is a rifle range nearby. 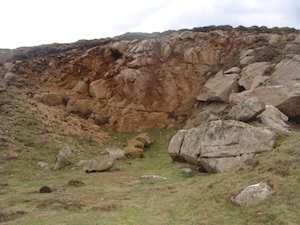 On Ronez Point, the quarry is a working one in granodiorite, diorite and some granite and visits can be arranged by applying to the Manager, but similar rock types can also be examined on the adjacent Sorel Point. 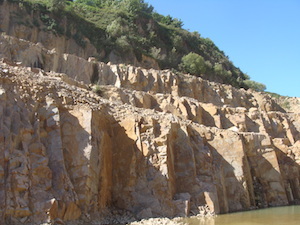 Further east again, quarries occur at La Saline and only very small outcrops at the once famous Mont Mado quarry; both require permission from present owners to visit. 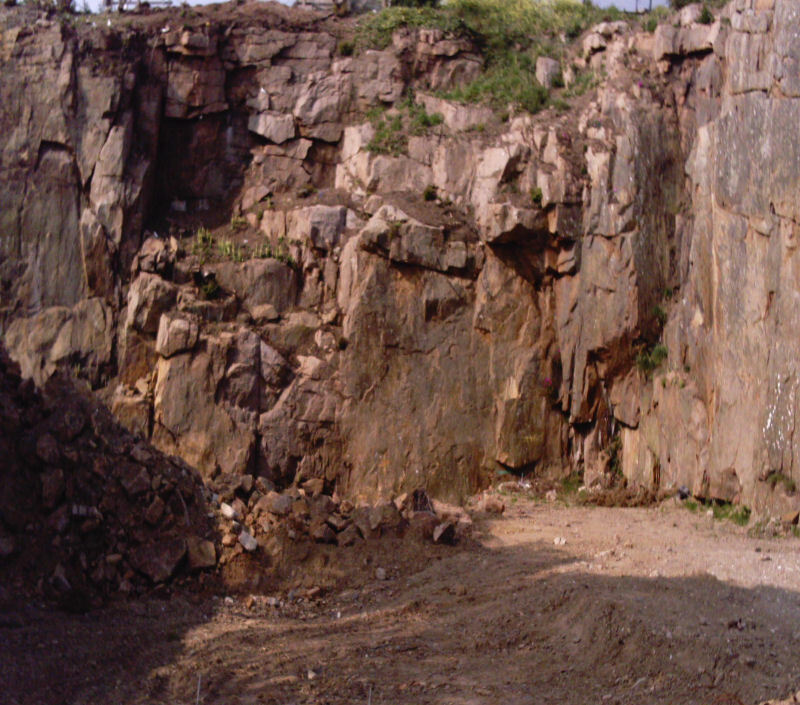 On the south side of the same granite mass, Gigoulande Quarry, in La Vallée de St. Pierre, is a working quarry and permission to visit may be obtained on occasions. In the SE Igneous Complex, quarries occur in the granophyre and aplogranite around Fort Regent on Le Mont de la Ville (and the old railway cutting to the east), South Hill, and just east of Le Hocq, a private quarry site occurs in the La Rocque granite. A visit to Elizabeth Castle provides a chance to see a greater range of rock types and their complex relationships in the small quarries below the castle (Bishop et al. 2003. p. 8-13). In the Jersey Shale Formation, small quarries occur in the west at L'Étacq and on Le Mont St. Matthieu but the larger ones occur in the lower part of La Vallée de St. Pierre. These are privately owned and may be difficult to access. 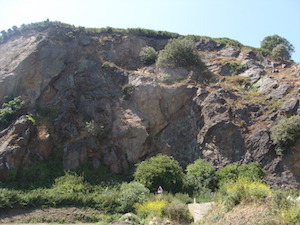 The andesites of the Jersey Volcanic Group were quarried at West Mount on the west side of St. Helier, at the bottom of St. Saviour's Hill and in La Vallée des Vaux. Again, these are privately owned, being residential sites, and permission to visit may be difficult to obtain. The rhyolites and ignimbrites were quarried inland, eg. down La Commune in Trinity (which is very overgrown in parts), and along the coast at various sites from La Crête Point northwards. These are generally more accessible being near the road, although the one at La Crête is partly protected by some undergrowth on a low earth bank. Lastly, the conglomerate of the Rozel Conglomerate Formation was quarried mainly in St. Catherine's area from Le Bel Val Cove north to Le Vicart, often called Gibraltar, a hill-like rock mass by St. Catherine's breakwater. The stone is well exposed in the breakwater and along the slipway. Le Quesne's quarry, La Moye. Cox, R. S. 1966 (Dec). Excavations galore! 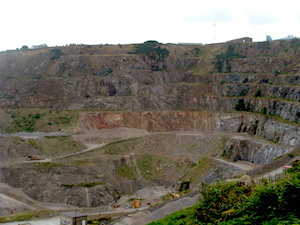 The Story of Jersey's Quarries. Jersey Topic. pp. 94 - 97.